Pink nail lacquer... a sure sign of spring - Susan Said... WHAT?! In addition to cheery daffodils, the sound of robins’ song, and vibrantly blue skies, for me, pink nail lacquer is a sure sign of spring. Gone are the deep reds and luscious burgundies that looked so right all winter. As the thermometer rises, I want, pink, pink, pink! Not only are the colors in this duo lovely, they last and last. The color-rich pigments provide one stroke coverage, high-shine finish, and chip-resistant wear. So, your mani-pedi will last longer and look better than ever before. The nail lacquers even contain Hydrolyzed Silk, Horsetail Extract, plus Vitamins B, C and E to promote strong, healthy nails. Plus, butter LONDON uses only the safest ingredients in every product. The company offers some of the most beautiful, long-lasting colors on the market without including harmful formaldehyde, toluene, or DBP in any of its nail formulas! 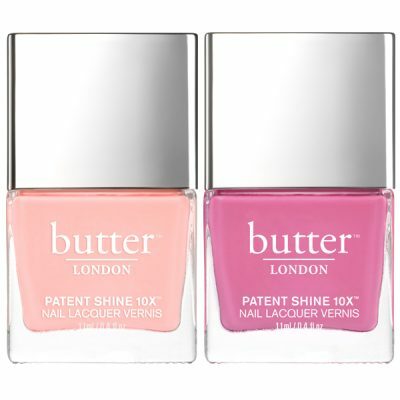 In fact, the butter LONDON name has been synonymous with exceptional nail lacquer since 2005. From W magazine, to Vogue, to Glamour UK, to Harper’s BAZAAR UK, butter LONDON nail lacquers are the top choice among stylists, celebs, and nail artists all over the world. To see more gorgeous nail lacquer options, plus a huge selection of must-have cosmetics like glosses, balms, liners, pencils, shadows, blushes, bronzers, highlighters, lip crayons (my absolute faves) and more, visit butter LONDON. Jingle, jangle... love that bangle! American Estate Jewelry launches "The Horse Collection" of stunning, sterling silver home accents! What to wear to the office holiday party! Separator image Posted in WOMEN'S HEALTH & BEAUTY and tagged with butter LONDON, nail colors spring 2016, nail lacquer, nail polish, nail trends 2016, Susan Said What? !.